HR and payroll leaders in the professional services field share their stories on how cloud-based solutions have empowered their companies. Learn how cloud-based solutions are empowering organizations in the professional services field. Organizations in professional services fields have unique hiring needs and pay structures that position them to leverage people management tools unlike any other industry. Read on to see how cloud-based people management tools are empowering industry leaders in the professional services field, and how they can do the same for you. Read full article below or download the printable version of the Business Performance Toolkit for Professional Services. The client-driven environment of the professional services industry requires a high focus on human capital management (HCM). After all, people are the primary asset in moving the needle on business growth for consulting, legal, or other professional services firms. Business and technology innovation creates more need for a highly skilled workforce and professional services firms often find themselves exhausting the supply of qualified talent—leading to a new need for talent development initiatives. The benefits discussed in the toolkit reveal how leading organizations in the professional services field have achieved superb business results through comprehensive, streamlined, cloud-based people management tools to champion diversity and empower their workforce. Moore & Van Allen is a south-east regional law firm with a national presence. The firm has earned a reputation for delivering high levels of client service and for providing sophisticated legal services in a broad range of practice areas. The firm prides itself on being technologically progressive and taking advantage of cutting-edge HCM technology. Moore & Van Allen sought a more robust solution for basic and strategic HR functions, including open enrollment, onboarding, and reporting. The firm chose a cloud-based solution and went live in January 2016. "Diversity and inclusion is important at Moore & Van Allen. We strive to be a reflection of our community and to demonstrate our values to our clients, some of which ask us to report our demographics in RFPs and surveys," said Patti Oswald, Director of Human Resources at Moore & Van Allen. The firm wanted to evaluate its diversity levels, and break down specifics by ethnicity, gender, and other factors. With comprehensive people management tools, the HR team gained the ability to obtain accurate data on LGBTQ and veteran populations in the workforce for the first time. Through a combination of configurability, onboarding technology, and self-service, the firm is developing a self-sustaining process to collect and maintain this data confidentially. Now they can glean voluntarily-submitted employee information that individuals may have chosen to not disclose during onboarding, through yearly surveys and emails. Oswald understands that HR’s responsiveness to the firm’s internal clients—attorneys and business development groups—translates into better service externally. Speed and efficiency are priorities, and solutions such as compensation management are providing great value. "The compensation management tool has been wonderful. It is helping us organize our decision-making process and strategies for allocating staff salary increases consistently across the company, and it empowers our managers to orchestrate this important process on their own," said Oswald. "Once I give the managers their budgets, they can go into the solution to view all their employees' records, make the desired adjustments, and then send the information back to HR electronically. It has replaced the constant exchanging of spreadsheets with a simple workflow. The managers love it, and I love it." Progrexion is a technology-enabled consumer services business that leads the way in credit repair. Their technology and services are used by Lexington Law Firm and by CreditRepair.com, a Progrexion subsidiary, and have a combined employee base of more than 3,000. Prior to switching to a cloud-based solution, Progrexion relied on paper-intensive processes for a variety of HR tasks, while struggling with simplistic and often outdated reporting. Progrexion sought an HCM solution that would help them get new employees productive quickly with faster onboarding, provide better reporting on retention, and contain fewer administrative burdens for employees. "The deployment was the best vendor experience of my career," said Brett Garlick, Director of HR Services at Progrexion. "They didn’t just meet our expectations; they delighted us during the process. Their launch experts sincerely cared about our success, and every challenge was met with a solution. Because of our expert, hassle-free rollout, HR was able to devote more time to change communication, and we achieved a smooth companywide transition." Once active, Progrexion began using their solution’s business intelligence to address key business issues and make data-driven business decisions to drive the company’s overall business growth. “With an all-in-one solution, we are able to furnish data to our executives that they have never had before," said Garlick. “We have made the information available through real-time dashboards and regular, automated reports. Our new level of reporting is changing the decision-making paradigm in the C-suite, and boosting the perception—and reality—of HR as a strategic business partner." As Progrexion executives increasingly recognize the value of business intelligence, Garlick and his team are taking advantage of training offered through the vendor to maximize the value they provide to the company’s leadership. Garlick reports that access to training courses and educational resources are helping HR get the most from the company’s investment in HCM technology. “Every time I take a training about our solution, I learn something that can elevate the service HR provides," said Garlick. “In addition, the learning opportunities available to my staff—in areas such as benefits, payroll and business intelligence—can improve their technical skills and overall knowledge of human resources. The training is making my staff more valuable and opening up additional paths for their careers with us." For more than 40 years, CORT has been helping companies that are looking to make changes to their workplace or uniquely showcase their company with a global network of affiliates in more than 70 countries. CORT, a Berkshire Hathaway company, serves more than 80% of the Fortune 500 companies with the most comprehensive range of destination services in the U.S. Previously, CORT took a multi-application approach to its HR management by using an enterprise resource planning (ERP) vendor for HR, a payroll service bureau for outsourced payroll service, and an in-house process for time and attendance. The assorted systems were both inefficient and expensive. Since going live with a cloud-based solution in July 2006, CORT’s IT team is now focusing its time and resources to key business projects. Now with comprehensive cloud technology, CORT has one end-to-end solution to handle its HCM processes including payroll, benefits administration, online benefits enrollment, and time management. This comprehensive scope of functionality is resulting in even greater gains than expected. "To accommodate our industry’s specific needs, we developed some of our own software for activities critical to running our business, like inventory management," said Debbie Lansford, Chief Financial Officer at CORT Business Services. "When we were considering potential HR solution providers, we wanted to ensure that our IT team would not have to support our new HCM solution and could focus on our core business applications." Another decision-driver for CORT in selecting a comprehensive cloud-based solution was the range of tools for time management which can leverage data from or provide data to billing systems. Previously, employee hours were collected manually by managers and forwarded to their supervisors. After obtaining necessary approvals, the hours and rates were entered on spreadsheets and funneled to a half-dozen offices, where they were compiled for payroll. Because information was passed from person to person, the process was time-consuming, confusing, and error-prone. “One of the most important benefits is how it has made processes easier on our field managers, who spend much less effort managing employee time records," said Eileen Buckley, Payroll Manager at CORT Business Services. “With an all-in-one tool, they can log in and see their team’s year-at-a-glance attendance, or a manager can drill down to study a specific individual’s data. Since sick and vacation time are submitted online, managers give instant approvals and can conveniently cross-reference requests against paid-time-off balances." Another detail-intensive challenge is streamlining open enrollment for benefits. Before making the switch, CORT’s HR team traveled to each location during benefits enrollment to distribute information, answer employee questions, collect the hand-written forms, and bring them back to the main office. Field staff would then fly in to the headquarters in Fairfax, Virginia to help input benefits changes and complete the cumbersome project. “Our cloud-based solution has made our HCM so much better—it’s like day and night in comparison to our previous methods." Organizations in professional services fields have unique hiring needs and pay structures that position them to leverage people management tools unlike any other industry. Outdated systems and manual processes will no longer be sustainable in the fast-paced, rapidly growing industry. Cloud-based, comprehensive human capital management tools can empower your workforce to reduce time spent on administrative tasks to assist your organization in recruiting top talent, engaging your employees and gaining real-time data insight. More than 4,100 organizations have selected UltiPro as their human capital management software of choice. Industry leaders have relied on UltiPro to serve their people management needs for more than a decade from HR and payroll to talent and time management. Ultimate Software has a proven track record of best-in-class functionality and unparalleled customer service. 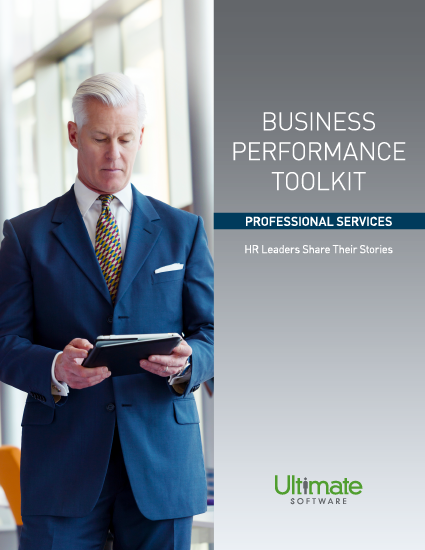 Download the printable version of the Business Performance Toolkit for Professional Services.